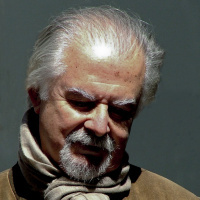 Fernando Botero Angulo (April 19, 1932, Medellin, Colombia) — Colombian painter and sculptor, one of the most famous artists of Latin America today. 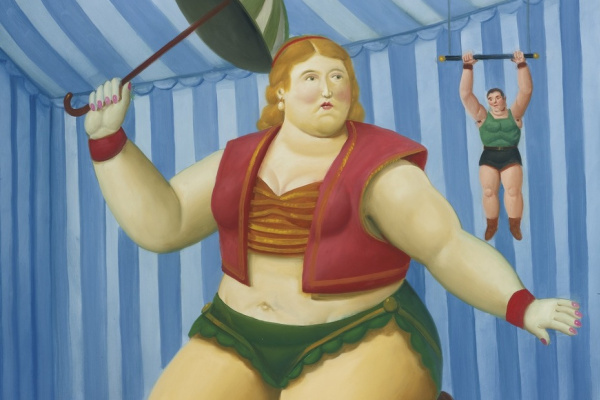 Botero’s works are recognizable around the world for his original style of figurative technology — in the paintings of this artist people, and often objects, look exaggeratedly voluminous. Fernando Botero is not only called "the main landmark of Colombian and Latin American art" - the artist can compete with another famous compatriot, Gabriel Garcia Marquez, in popularity. 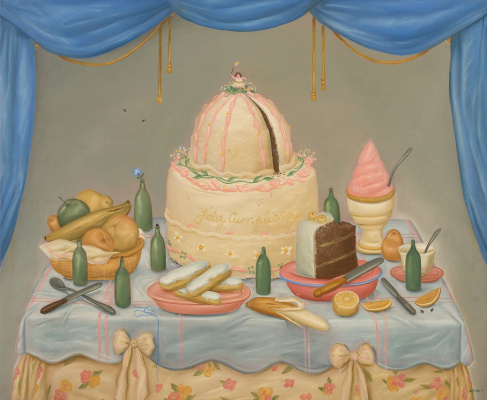 Features of the artist Fernando Botero: if in his youth Botero’s paintings were so stylistically diverse that viewers could take them for the work of various artists, the current style of the artist does not change over the years. Looking at his charming "fatties", it is impossible to say whether the work was done recently or 20 years ago. Among his works are parodies of famous paintings by European artists: Leonardo da Vinci, Van Gogh, Raphael, Jean Auguste Dominic Engres. 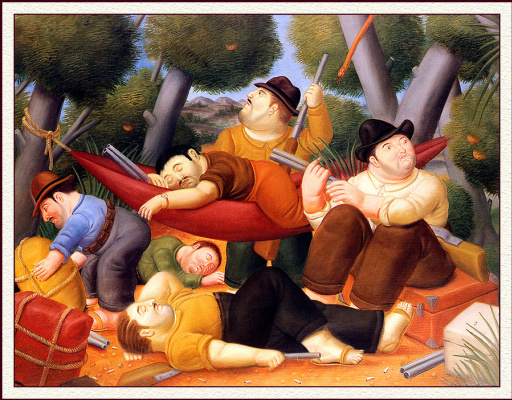 At the same time, Botero, in his work, also addresses the dark sides of life — for example, the theme of the war of drug clans in his homeland and the abuse of prisoners at Abu Ghraib prison in Iraq. 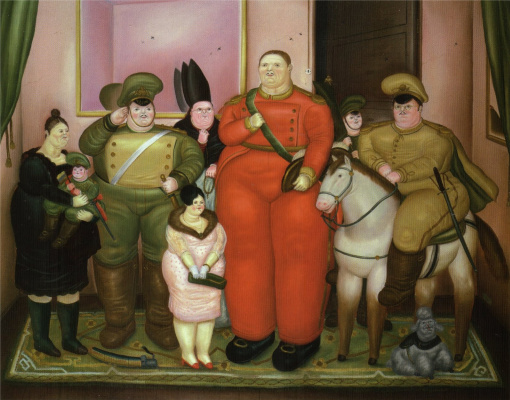 Fernando Botero has developed his own recognizable style, it is based on the compositional relationship between the figures and the space they occupy. Its giant inflated bodies and objects look weightless, despite the volumes. 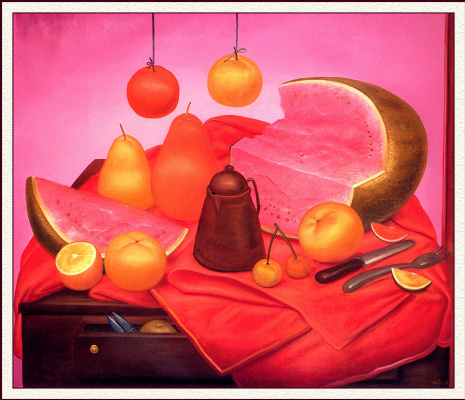 The original "bloated" style came to Botero in the second half of the 1950s, when at the time of writing "Still Life with a Mandolin" the instrument suddenly acquired grotesque dimensions. 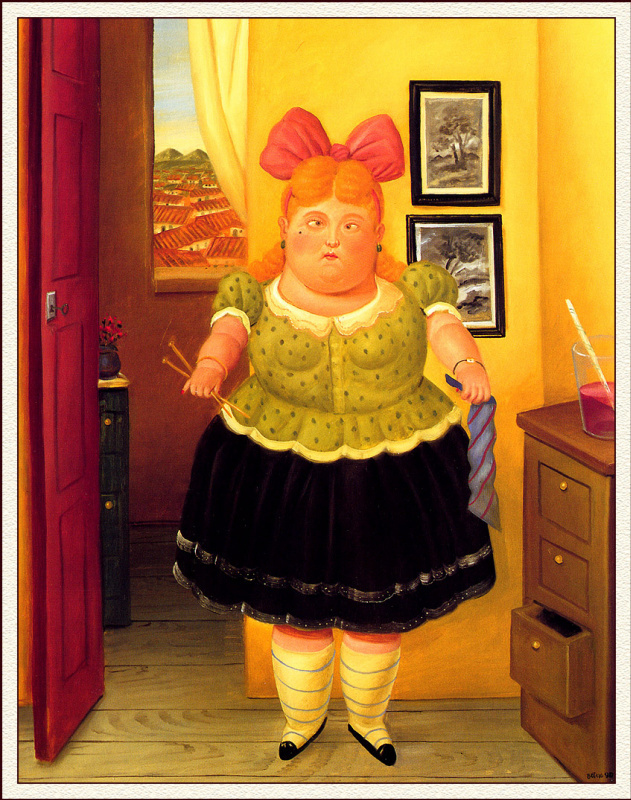 Botero himself insists that his characters are not fat, but "voluminous". "I do not draw fat women. No one believes me, but it’s true. What I draw is full. When I paint still life, I also make it voluminous. The same goes for animals and landscapes, he says. "Whoever I wrote — a woman, a man, a dog or a horse — I always do it with the idea of volume, and not because I am obsessed with fat people," the artist emphasizes. 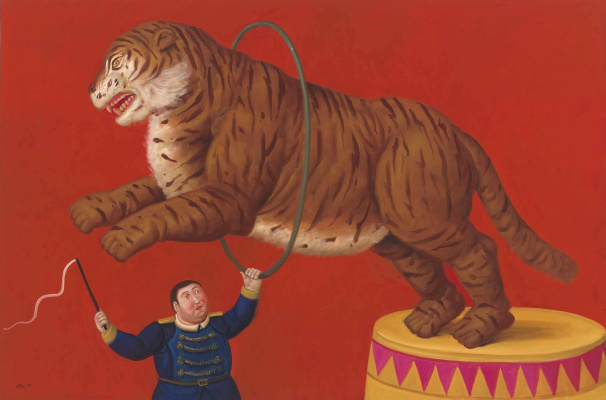 In the paintings of Botero there are many signs of Latin American folk art — bright colors and boldly outlined forms. On his own behalf, he added the absence of an obvious brush stroke and texture. Botero pays a lot of attention to lighting in his studios — in his opinion, the light should certainly fall from the north. The artist uses all traditional materials in painting — oil, watercolor, pastel, and so on, with the exception of acrylic. 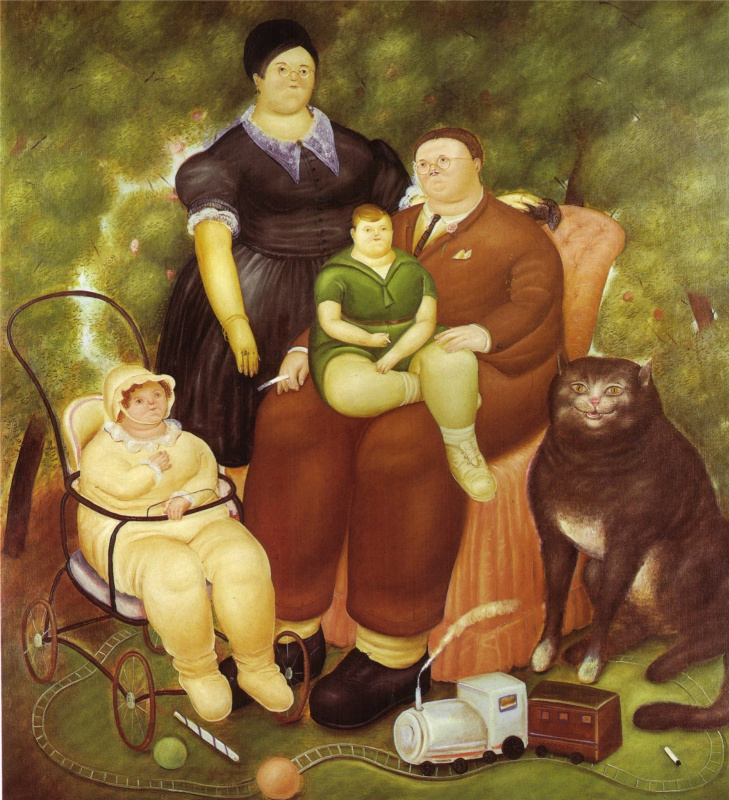 Famous paintings by artist Fernando Botero: "Presidential Family", "Mona Lisa at 12 years old", "Rich Children", "Loving Couple", "Collector", "Cat on the roof", "Dancer at the Pole". Fernando Botero Angulo was born in Medellín on April 19, 1932. He was orphaned early — his father Fernando died when the boy was only 4 years old. Botero dreamed of becoming a bullfighter and even practiced for several years in the school of matadors, enrolling in it at the age of 12 years. But then Fernando declared to his extremely conservative family that he decided to become an artist, and, despite the resistance of relatives, he fulfilled his desire. He transferred his passion for bullfighting to paintings, later creating a series of thematic works. Already in 1948, El Colombiano published the first illustrative works of Botero; the fee went to pay tuition at the Lycée de Marinha Antioquia. The first solo exhibition of the young artist was held in Bogota in 1952 in the gallery of Leo Mathis. In his work, Botero drew inspiration in pre-Columbian and Spanish colonial art, as well as in the works of the famous Mexican monumentalist Diego Rivera. In the early 1950s, Botero studied painting in Madrid, making a living by copying paintings.Goji andVelazquez for sale to tourists. Up until the early 1960s, the artist traveled extensively, exploring artistic treasures in museums in France and Italy. Career Botero went up the hill in 1958, when he won the top prize at the Salón nacional de artistas in Bogota. 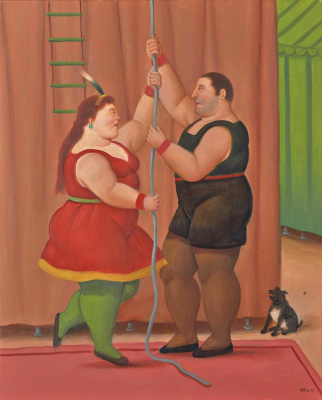 After group and solo exhibitions in America and Mexico, including the Guggenheim Museum in New York, Botero was appointed professor of painting at the Art Academy of Bogota. Three years later, the New York Museum of Contemporary Art acquired his painting "Mona Lisa at 12 years old". In 1973, Botero came to Paris, where he became interested in creating sculptures that became world famous in the 1990s: Motherhood, Left Hand, Roman Soldier and others. 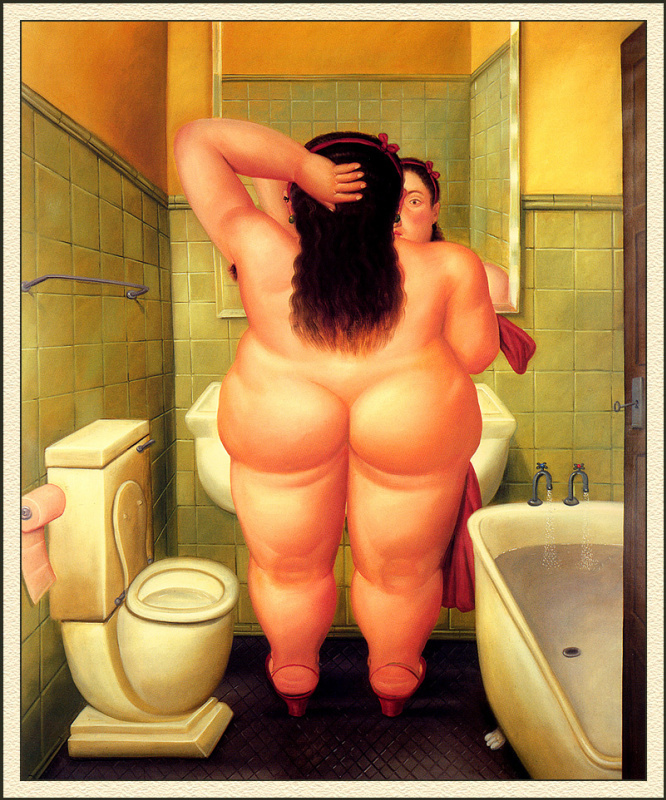 Botero was married three times, and, according to the artist, all his companions of life were slim women. The current spouse, a sculptor from Greece Sofia Vari, according to Botero, weighs only 55 kilograms. The artist has four children from his previous wives: three from Gloria Cea, the former Minister of Culture of Colombia, and also a son from her second wife, Cecilia Zambrano. 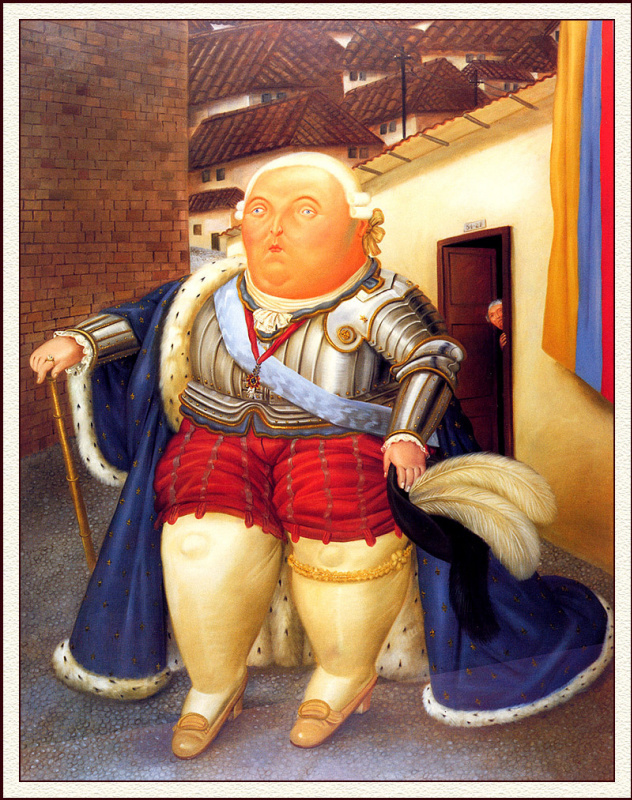 Fernando Botero collected the work of his colleagues, but later donated the entire collection to Colombia, and it became the basis for the museum named after him in Bogota. After that, the artist stopped buying works of art. 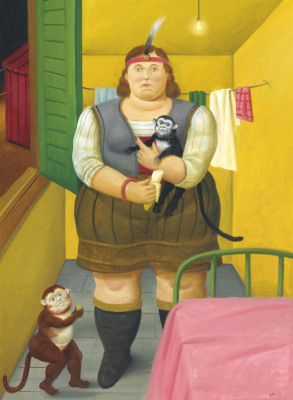 In addition, Botero donated more than 400 of his own paintings to state institutions. It first happened in 1978, when the Museum of Antioch in Medellin expressed a desire to purchase one of his works. Despite the fact that Botero’s age is approaching ninety years old, the artist is quite alert, he works a lot every day, and, moreover, he stands upright. Botero is one of the richest artists in the world, he has several studios where he paints — in Paris, Monte Carlo and New York, as well as his own foundry in Tuscany, where he works on large sculptures. 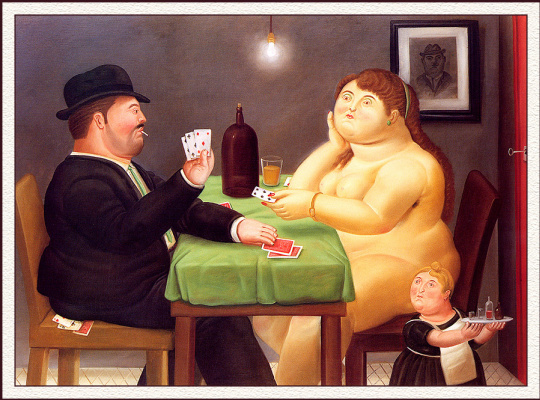 Perhaps no month in the year, when somewhere in the world would not open an exhibition of works by Botero. The artist has so far created more than 3000 paintings and more than 200 sculptures.